Why revenue-oriented metrics are ultimate KPIs, and always need to be present when talking about conversion rate. I have been requested several times to create “dashboards” (mind the quotes) containing powerless metrics. Powerless because the client has not thought about the business question/s behind the dashboard in the right context, so data be easily misinterpreted. Context is so important. For example if I don’t know the impact of an improvement in the conversion rate (CR) in the revenue, then I cannot know if that’s good or bad news. In theory more CR leads to more revenue, but that’s not true necessarily. That´s why CR should go together with a revenue metric, that can be the revenue itself or at least something like average order value . I think it was at Congreso Web, in Zaragoza where I heard from one the best analysts I know (Xavier Colomes) that he can “believe” any excuse we analysts claim to justify our lack of action. But there is an exception, he cannot believe that your boss does not want to make more money (more revenue). And I agree with him. Why revenue is that important? Because it can tell you whether the business (or business unit etc.) is improving over time or not. Any other metric is not that powerful. Specially CR. I have seen too many times the conversion rate going up and the revenue going down, and the other way around. Revenue gives you the right context to analyse conversion rate. Explanation is simple. If you sell i.e. theatre tickets, customers buy normally two tickets (couple) or let´s say four (group of friends). Always one transaction, but units and AOV (average orde value) are going to be twice bigger in the second option. It also happens when you sell i.e. an offer for a cheap meal, that makes an improvement in transactions and CR of i.e. 10%, but in terms of AOV, or revenue could be just i.e. 2% if that´s product is way cheaper than your average. Still good, as any improvement, but the spike is not as good as we would think if we would only look at the CR. This does not need to happen in every company. I don’t think anyone buys six pairs of boots in different colours at the same time. But units (number of product being sold) is a very important metric in some industries. The key idea is that focusing on just improving the conversion rate (without any context on the real impact in the business) is like focusing on improving just the bounce rate. Why should we work to optimize the revenue and not the conversion rate? Some products (or categories, or packages etc.) may have a smaller conversion rates but generate more revenue. And we should identify them by segmenting our data, and then try to improve the conversion rate in these specific segments. That´s why I think that when we create a dashboard or talk about CR, we should look at the evolution of the CR and its impact in the final goal of the company (that is, making money). I am not a football fan, but will use it for a clear example. 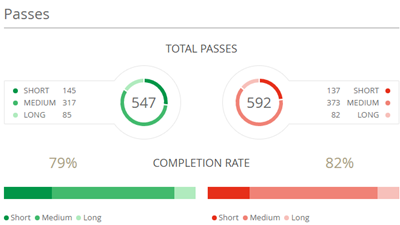 What´s the ultimate “conversion” KPI in football? What micro conversions lead to get more conversions or goals? Let´s mention a few key football metrics: corner kicks, shots on target. ball possession, dangerous attacks, avg. kilometers per player etc. Anyone cares if you have improved your “shots on target” rate if you lose 7 -1. And anyone cares about an improvement in <insert your fave metric here> if the revenue goes down. Specially the CR. Data need context. And part of the context of a micro conversion is how the macro conversion is affected. Thus, part of the context for the i.e. customer retention metric is how the revenue is affected. Same thing, in a football match. Goals needs to be related with the metric dangerous attacks. Any other thing is pointless and may make us think that something is going well when actually it´s not (or the other way around). We should care about the revenue and a few KPIs, like CR. But these KPIs need to be segmented and measured together with their impact on the revenue. We are talking about what they care. The language of money is always understood. This same idea should apply when we focus of our analysis in a specific part of the funnel. We should look at the CR, or the next step to get the whole context. It may happen that the Transition Rate (TR) from step A to step B is working better for a specific product, device etc. but the Conversion Rate (CR) is worst. Or the other way around. And that´s something we need to know. Esta entrada fue publicada en EN - Data Analysis el 30 noviembre, 2017 por Geekeando en Analytics. I heard for the first time about using Cohort Analysis in Adobe Analytics during the talk “The Chef’s Table” from Ben Gaines at Adobe Summit EMEA in London last May (2016). Ben explained that Cohort Analysis was one of the cool things coming with Workspace. I immediately thought that it’s an “ingredient” that should be present in any analyst’s table in which meaningful insights are to be prepared. that takes the data from a given dataset”. To put it clear and adapt the definition to the context, I will say that a cohort is a group of users who performed a specific action at the same time. 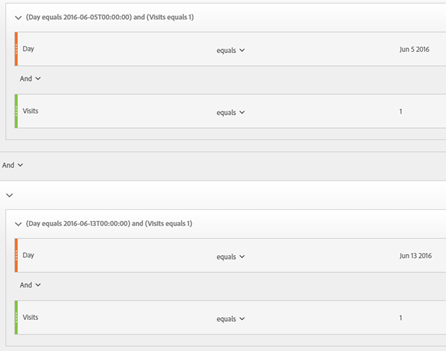 For example: users who came to our site from a PPC campaign and created an account on the first week of May. That’s the cohort, and the cohort analysis will let us take a digging about i.e. the amount of purchase orders generated by that cohort during the next ten weeks. Looking at conversions / user behaviour over time, cohort analysis helps us to understand more easily the long term relationship with our users or customers. – How effective was a PPC campaign aiming for new accounts in terms of orders over time? – How is the purchasing loyalty for a specific product category? – What segments (cohorts) generate more revenue over time? – How is the engagement in terms of returning visits generated by a specific action? We can now easily evaluate the impact and effectiveness of specific actions (or campaigns etc.) on user engagement, conversion content retention etc. And last but not least, we can apply segments, so we can focus only on a section, referrer, device etc. that is key for us. How Cohort Analysis can be done in WorkSpace? The metric that places a user in a cohort. For example, if I choose Create Account, only users who have created an account during the time range of the cohort analysis will be included in the initial cohorts. The metric that indicates the user has been retained. For example, if I choose Orders, only users who performed an order after the period in which they were added to a cohort will be represented as retained. The inclusion and return metric can be the same. For example Orders, to watch the purchasing loyalty. 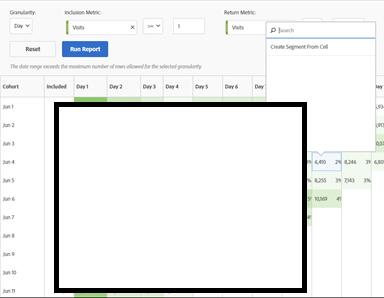 To know what have in common the users behind a specific cell we want to analyste further, just right click on a specific cell and it will open the segment manager tool containing the cohort. Cohort Analysis can help to analyse the long run. It´s very common analysing how many sales have been generated by the different campaigns and “that´s all”. But Cohort Analysis can help us to know what happened over time with customers who bought for the first time from campaign a and the ones who did for b, o who purchased product type a or b. And you? How do you watch your key segments over the time? Any idea? Any comment? Any complaint? 🙂 Leave your comment and I will get back to you. You can also contact with me via email geekeandoenanalytics@gmail.com o through my Linkedin and Twitter profiles. Esta entrada fue publicada en EN - Adobe Analytics, EN - Data Analysis el 15 marzo, 2017 por Geekeando en Analytics. Is an anomaly the same thing as a spike or a dip? for a specific period of time. And it might be “created” or “expected”. For example, if we run an extra £10000 PPC campaign, then it’s normal we will have an increase in traffic (due to that campaign). Thus, if we have 20% more of traffic and 17% more of conversions, that’s not an anomaly, just a spike. An anomaly is more about the way that metric has changed and has an statistical approach. For example, if one day 23% of the orders come from a specific campaign that represents just 3% of the traffic, that’s an anomaly, but can also be a spike or not. How can we get started with Anomaly Detection? The three training periods available are: 30, 60 and 90 days. Note a bigger training period may reduce the size of an anomaly. As soon as we click on an anomaly, we see below the graph the actuals and what would be reasonable for that metric during that period of time. Additionally, we also see its impact on percentage (in green if it’s positive and in red if it’s negative). 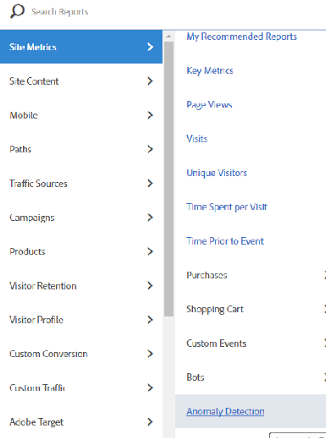 Adobe Analytics suggest a range a “items” (that can be product, campaign etc.) in which an anomaly has been spotted. -1: Complete association for a dip or complete inverse association for a spike. Just click on one of the items (rows) and a button to create a segment containing that item (product, campaign, referrer etc.) will appear. Next steps? Save the segment and apply it by referrer, device etc. in order to take a digging and know what´s going on..
As you can see, it’s very fast to identify what’s “unusual” and the segments we need for our analysis, and it will save us loads of time. Esta entrada fue publicada en EN - Adobe Analytics, EN - Data Analysis el 26 septiembre, 2016 por Geekeando en Analytics.